We can bet you’ve driven by an adorable house with a bright yellow door and thought, “I wish I could do that to my house.” Good news: you can! Painting your exterior window shutters is an easy and low-cost way to add curb appeal to your house. Bright shutter colors like aqua, red, green, and even purple will completely transform your home. If you’ve been looking for ways to add curb appeal to your home without an expensive add-on or an entire exterior coat of paint, adding a colorful hue to your window shutters is the ideal way to get I wish I could do that to my house curb appeal. If you’ve always thought a light blue door and shutters might work, now’s the time to grab some paint samples. These colorful shutters are the easiest (and cutest!) way to achieve enviable curb appeal. Turquoise shutters will make an all-white beach house stand out without looking cheesy. If you only have shutters on the upstairs windows, you have an ideal opportunity to add a little color without going overboard. For an understated, classic look, keep your door neutral and just paint the shutters. Just think of the pretty paint shades that would match your hydrangeas. Take a walk down a New Orleans street, and you’ll be inspired by all of the fun, beautiful house and shutter color combinations you see. If you’ve always wanted a house that’s your favorite color, you can have it. Stay in the same color palette, but go darker on the shutters than the house. Colorful shutters work on any architecture, even classic, old-school homes. Even the lightest shade of pastel paint adds curb appeal. Painting the garage door the same hue as the shutters ties the exterior of your home together. If you have window boxes, paint them the same color as the shutters for a bolder look. If you don’t have window boxes, add them for instant charm. Bright red is an intimidating commitment, but toned-down, rustic red has mountain-cottage charm. The shutters, the house, the front door, and the trim can all be different colors and look fabulous together. We recommend getting the help of a designer or contractor for something this bold, though. You may have never thought about cutouts, but sailboats or starfish for a beach house, or a simple diamond pattern for a cottage would look adorable. Whether on the front porch or back, floor-to-ceiling French door shutters add so much character. Can’t get enough of the color on your shutters? Paint the handrails to match for another flash of that hue you love. Even the smallest shutters add curb appeal when they’re painted a bright color. Large urns or porch furniture that coordinate with your painted shutters give your home a put-together look. 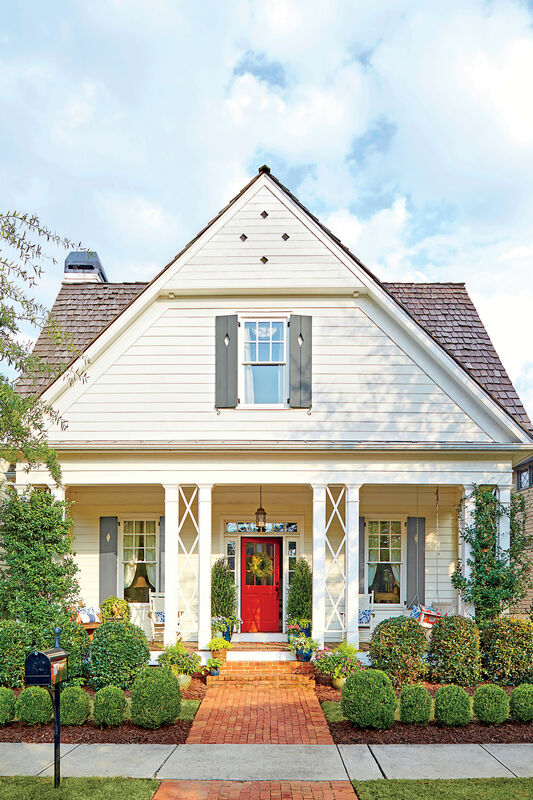 You can’t help but smile when you walk through a colorful front door with matching shutters.